Heather Dixon grew up in a large family with four brothers and six sisters. 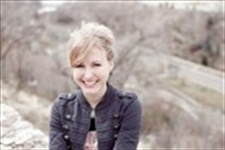 She is a storyboard artist as well as a writer, and lives in Salt Lake City, Utah. The Viennese waltz is her dance of choice. Visit Heather Dixon’s blog. CLICK HERE FOR MORE BOOKS BY HEATHER DIXON. 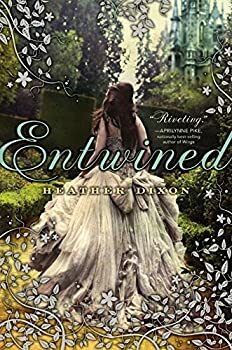 Entwined is a retelling of the fairy tale “The Twelve Dancing Princesses,” in which the King’s twelve daughters slip away to a mysterious underground realm every night and dance their slippers to ribbons. Heather Dixon chooses to focus mainly on one sister as the heroine: Azalea, the eldest. At the beginning of the book, the Queen dies giving birth to the twelfth princess. Azalea and her sisters are heartbroken, and to make things worse, their stiff-necked father the King pushes them away in his own grief. He also decrees that the entire family will be in mourning for a year, which means no dancing. Then the girls discover a magical secret passage that leads to a beautiful place where they can dance every night… for a price.